An Iowa company and two executives are expected to plead guilty to selling tainted eggs that were responsible for a 2010 salmonella outbreak that sickened thousands and led to an unprecedented recall of 550 million eggs, according to court documents filed Wednesday. 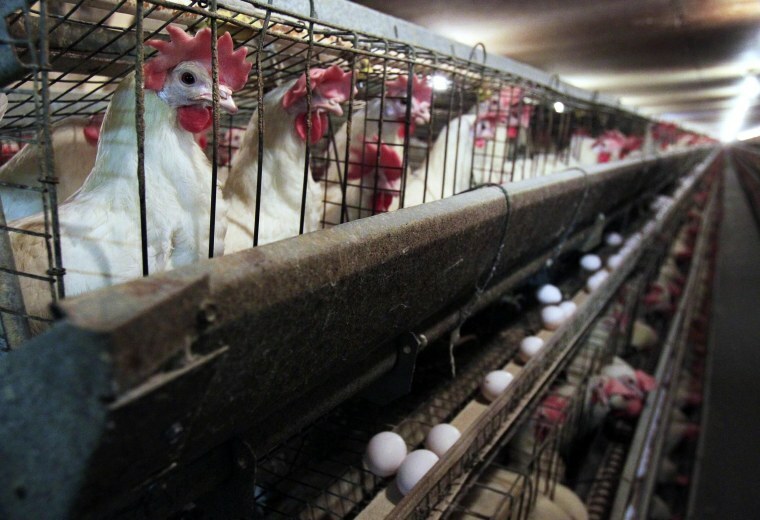 Disgraced egg industry titan Austin "Jack" DeCoster and son Peter DeCoster are charged with introducing adulterated food into interstate commerce, a misdemeanor that carries a maximum sentence of one year in jail. A charging document filed by federal prosecutors alleges that their company, Quality Egg LLC, sold eggs tainted with salmonella from early 2010 until the August 2010 recall and that the DeCosters were the responsible corporate officers. The DeCosters are scheduled to plead guilty June 3 as part of plea agreements expected to resolve the four-year investigation, though it's unclear whether prosecutors will recommend jail. The punishment will be handed down in the same federal courthouse where Jack DeCoster received probation in 2003 for knowingly hiring illegal immigrants. Two felonies also were filed against Quality Egg, which includes the DeCosters' former network of chicken farms and egg production sites in northern Iowa. Corporations can face criminal charges under the theory that they are responsible for employees' actions, with felony convictions carrying fines of $500,000 apiece, or more, depending on the amount of loss. The company is charged with introducing misbranded food into interstate commerce by selling products with labels that "made the eggs appear to be not as old as they actually were" from 2006 to 2010. It also is charged with paying bribes to influence a U.S. Department of Agriculture inspector on at least two occasions, including in April 2010, to approve eggs that had been retained for failing to meet federal standards. The company also is expected to plead guilty. Frank Volpe, an attorney representing Jack DeCoster and Quality Egg, declined comment on Wednesday.